Disclosure: The Renuzit® brand provided me with a sample of Renuzit® Pearl Scents® in exchange for a product review. However, all the opinions expressed here are my own. Anyone who knows me can attest to my love for all things that smell good. I mean, that makes sense, right? I think we gravitate towards things that smell good - think, warm apple pie, funnel cake at a carnival, fresh laundry. Scent also has a way of creating and maintaining memories. For example, have you ever been somewhere and smelled something that brought you back to another place and time? Every year around Fall time, I walk outside, and one day there will be the scent of Fall in the air which reminds me of pumpkin picking, hearty food and hoodies and jeans. Renuzit® is known for their extensive line of home fragrance products which deliver in odor elimination and long lasting freshness. They've recently released their Renuzit® Pearl Scents® which are an excellent choice for no-maintenance home fragrance. Renuzit® Pearl Scents® are designed to accent your home decor while providing up to 30 days of long-lasting, odor neutralizing scent. Currently, they are available in 5 unique scents, including: Blue Sky Breeze (blue), Serenity (purple), Sparkling Rain (green), Tranquil (turquoise) and Seductive Pineapple (yellow). With a convenient size and effortless function, they make the perfect companion to any home and style. Unlike candles or plug-ins, they are worry-free and require nothing on your part aside from taking off the film that protects the scent pearls, putting the decorative top back on, and placing it in the place of your choosing. They are portable, stylish and effective at delivering long-lasting fragrance. I've had a great run with the Renuzit® Pearls Scents®. I was sent the Blue Sky Breeze fragrance, which is a crisp, clean scent. It's perfect for this time of year! I originally put it on the table in our walkway so that people could smell it as they entered our home. Even though the area is very open and is surrounded by several other rooms in the downstairs of our home, I found that this performed wonderfully. We recently had a party at our house, and for that I put the Renuzit® Pearl Scents® in the bathroom. I found the scent to be more concentrated in the smaller area, which is perfect for the bathroom. I've been using this for several weeks and I have yet to smell the scent dissipate. I'm very drawn to the little scent beads too; they are so cute! Inside each bead is oil that contributes to delivering the glorious scent all around. Take the personality quiz to find out which Renuzit® Pearl Scents® is meant for you! I got Blue Sky Breeze (what a coincidence) and a $2 off coupon! Enter below to win a coupon to get one for FREE! There is nothing worse than a stinky dog. I ought to take out stock in the candle companies for how often I purchase and burn candles to ensure that my house doesn't smell like "dog". Don't get me wrong, I love my dog, but I prefer the element of surprise when it comes to animals. I take pride when people walk in and say, "Oh, I didn't know you had a dog/cats". This translates to me as, your house does not smell like "dog/cat". This is semi-difficult for me to get away with because said dog happens also to be a 100 lb black lab. So..... you may not smell him, but I'm willing to bet that you can see him, or he has let you know of his presence. It between baths, it's nice to keep my pup smelling fresh, and I recently discovered a pet deodorizer that is up to my standards. Introducing: Lovely Fresh Natural Pet Deodorizer. I have a 100 pound 6 year old black lab, so bathing him on the regular is a real pain in the you know what. In the Summertime it is much more tolerable because we can do it outside, but n the Winter, its a whole different story. Plus, as most labs do, he has super sensitive, itchy, irritated, flaky, no good, very bad skin. So bathing frequently is out of the question anyway. Enter in the Lovely Fresh Natural Pet Deodorizer. First an foremost, the spray covers up the "dog" smell. Being realistic here, if your dog rolls in somethng stank, chances are this will not cover it up and you will need to go ahead with a bath. However, for maintenance in between baths, this is your best bet. It has a spray top which delivers an extremely fine mist of pleasantly orange smelling product. I'm a citrus scent lover, so this is right up my alley, but what makes me even more happy is the natural ingredients that this is made out of. Some of which are collodial oats, pure neem oil and Vitamins A, D and E. These are all very helpful when dealing with skin issues. So, not only does this product address the smelly dog issue, but it also works to improve some of the very common skin issues in many breeds of dog. In my experience, I have found that this is a brilliant product. See, my dog tends not to noticeably smell, unless of course he has gotten into something. That being said, when I pet him, my hands are left smelling like dog more times than not. When I use this spray, it eliminates that after-smell on m hands. I wash my hands anyway, but it's nice to know so that when guests come over I don't have to be anxious about their hands after touching the dog. When I am in a hurry I can give him a quick spray-down, or when I have more time, I will brush him and make added effort to spray his areas that are super-dry or irritated. I'm not sure how often this is intended to be used, but I probably use it once per week, and maybe more if there are going to be visitors, or he is smelling particularly stinky. If you have a dog, or even a cat, that could use a little dry/irritated skin relief and a fresh scent, I highly recommend the Lovely Fresh Natural Pet Deodorizer. It can be purchased on Amazon HERE for $11.95, and you get a large 8oz sized spray bottle. I love how reasonable the cost is! Disclosure: I received a copy of this book complimentary in exchange for an honest review through Litfuse Publicity Group. The opinions stated here are entirely my own. Raising children is no easy task. It is probably one of the most overlooked responsibilities because so many people do it, and it is just seen as a normal part of the average person's life. I must say that social media brings a whole new realm to parenting as well, because you open yourselves up to the critique of everyone else when you share bits of your life. Honestly, I feel that most people are doing the best that they can to bring up moral, well-rounded children. Some people are just better at it. 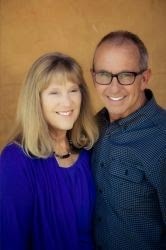 I recently had the opportunity to read the book Never Say No: Raising Big Picture Kids by Mark and Jan Foreman. You know, the parents of Jon and Tim Foreman of the band Switchfoot. How's that for Big Picture for ya?!?! 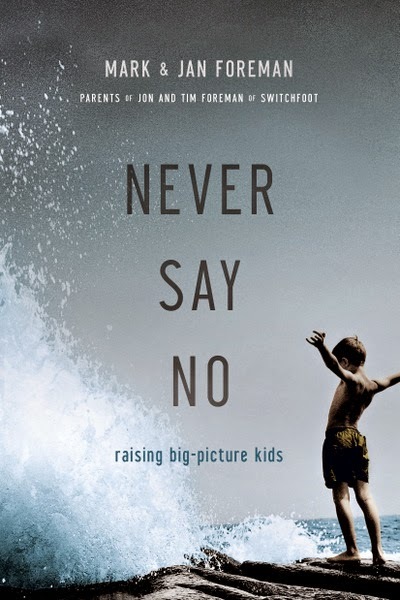 When you read "Never Say No" you may be thinking that this is one of those parenting books that focuses on a form of gentle parenting, where punishments and discipline are nowhere to be found. Let me reassure you that "Never Say No", instead, stands for giving your children the opportunity to form a relationship with you. Of course no parent can never tell their child no. There are boundaries, and rules that need to be followed, but when you overuse the word "no", you close the door to an important level of communication and relationship with your child. And, as they say, eventually they will stop asking. The speak to their relationship with God, and how they chose to enjoy their children the way that God enjoys us, by using their particular parenting style. This is also a testament to their ability to foster their children's unique capabilities and strengths with guidance from God. I love the way this book is set up. It is told by both parents, Mark and Jan, where they alternate chapters. As a mother, I could absolutely relate to the stories and point of view of Jan, and also appreciated hearing things from Mark's point of view. There are also some seriously thought provoking questions at the end of each chapter. When taken seriously, you can get an honest look at the type of parent you are and the type of parent you wish to be. Depending on how you parent, this book could be very eye-opening, and for the better. I'm thankful that I have this by my side to refer to when I am struggling or just need some inspiration. I would love to re-read this ever couple of years and compare my notes of how I answer the questions. This book is not intended to be read with little attention as the meaning is made whole by the way you answer the questions, and your own willingness to be honest and learn more about yourself. Ample Nutrition was created by a group of veterinarians who have time and energy invested in the well-being of dogs. I could not think of a better group of people to create a supplement for dogs, because no one knows them better. With careful consideration, they chose 11 probiotic chains and 1 prebiotic booster to create their Complete Dog Prebiotic and Probiotic. What makes this product unique is that the ingredients are considered "live" making them more useful once ingested. They remain this way for 18 months which is a considerable amount of time. The product itself comes in a nickle sized tablet that is bacon and cheese flavored. Depending on the size of your dog, one or two per day will provide them with the benefits of probiotics which includes: normalizing digestion and regularity, immune system support, rebalance the gut after antibiotic treatment and resolve diarrhea issues that your dog may be experiencing. On top of that, these Complete Dog Prebiotic and Probiotic are 100% natural, made with human grade ingredients, made in the USA, contain 3 billion microorganisms per tablet and are formulated without meat, chemicals, GMOs, soy, yeast wheat or gluten to give to the most sensitive of dogs. Plus, they are safe for puppies too! I am always super-excited when I get to try something for the dog. I know how beneficial probiotics are for humans, but I had no idea that these same benefits carried over to dogs as well. It makes me feel great to know that I am providing my pup with healthy gut matter and keeping his immune system resilient. As I mentioned earlier, I have a Laborador, so the fact that this is "food" makes it desirable for him. He is always excited to get his tablets, and he thinks he is getting a special treat. It is difficult to say if or how these are working, as I am unable to observe what is going on in his gut, and he is an otherwise healthy dog. I am pleased with the ease of use however. This requires a once per day administration, which makes it easy to remember and no hassle. The only downfall I see is the price, as they retail for $67.99 per bottle of 60 tablets. There is just no way that I could afford that monthly, as it adds up. Luckily, if you purchase through their website, you can get a coupon code to purchase a bottle for only $10.00! And they are backed by a money back guarantee. If you wish to purchase these for the dog(s) in your life, you can do so HERE. Just click on the Buy Now on Amazon.com button, and a coupon code will pop up which will allow you to get a bottle for $10. You can also buy directly from Amazon HERE. Summer Feet In a Jiffy! I'm guilty of neglecting my feet all Winter long. They are covered in socks and almost completely forgotten about during the cold months. Magically, each Spring, I expect that my feet will just look glorious for sandal season, and obviously, they just don't. I don't have the time, money, patience, etc... to get regular pedicures where someone can slough off the dead, dry, cracked skin on my feet, so I have to do it on my own, or simply neglect it altogether. I tend to choose the latter because I'm kinda lazy and it requires some effort to get my feet in tip-top shape. I get dry areas on my heels and calluses on the outer edge of my foot, below my pinkie toe. Luckily, there are useful tools such as the Pedi.Cure Callus Remover which make a Winter-full of neglectful care a cinch to take care of. The Pedi.Cure Callus Remover is a wonderful beauty product to have in your arsenal. The set comes with the Callus Remover, 2 sanding heads, and a brush to help with cleaning. Everything is packaged neatly in the box, so you can keep it conveniently stored. The Callus Remover is battery-powered by 2 AA batteries which are not included. I thought the battery compartment was easy and fun. You twist the bottom section and then pull it out to insert the batteries. Once the batteries are properly installed, you take the protective cover off of the sanding strip and work those calluses away. It is best to do this with clean feet, and I have found that coming right out of the shower or tub is the best time because the skin is softer and less resistant then. That being said, it is water resistant, so it can be used in the shower. It is important to note that from a hygienic standpoint, it is not meant to share with others. It can be used by more than one person as long as the sanding head you use is different. And obviously, or at least it should be, you should not use this on broken skin or infected areas. The roller head spins 40 times per second, and the directions warm against holding it on one area too long or applying too much pressure while using it. I was very nervous to use this after reading about how gentle you need to be while using it. I thought for sure that when I turned it on that head was going to be spinning like the wheel on moving car, that I would need to be super careful and gentle with it, so as not to hurt myself. I found however, that it actually proved to be more on the gentle side. If someone had awful dry skin and calluses, I highly doubt that this would remove them on the first try. It would require repeated use, and even then I am not certain that it would cure the problems altogether. My feet were not that bad when I used this, and I certainly noticed a smoothing effect. Areas that were noticeably dry and callused were smoothed over, however, they were not non-existent. It takes years and years and years to build a callus up to where it is. One use of a battery powered anything is not going to get rid of it, unless of course it is a legitimate sander, and you may also need a trip to the hospital afterward too. I feel that with repeated use, say, once per week, could take dry, callused winter-feet to flip-flop ready feet by the time Summer rolls around. I went into this with no expectations, so I am not disappointed in the way this product functions. I have read some Amazon reviews of dissatisfied customers, who certainly had high expectations. Using this one to two times per week after a shower keeps my feet looking and feeling smooth. I also follow up with a foot lotion or some argan oil, which is especially helpful before bed so my feet soak it up all night long. The Pedi.Cure Callus Remover has a 90 day money back guarantee, so if you are dissatisfied, you can return it. If you are interested in a quick and easy way to get your feet looking and feeling spiffy, you can purchase your own Pedi.Cure Callus Remover HERE. Currently they are on sale for $19.99, which is a very reasonable price. They also come in your choice of blue or pink! There are an array of skin issues that we suffer in my house. From facial skin issues like pimples and blackheads, to body skin issues like eczema and bumps to seasonal issues like bug bites and poison ivy-there is never a dull moment. I love when I can find a product that address MANY needs, as it saves space in my cupboards for other things. Sometimes going to the store and searching for products that can be used for the entire family, for an array of issues, and is made with natural ingredients can become overwhelming pretty quick. Especially with a curious and rambunctious 3 year old. Thankfully, there is a product out there that address many household skin concerns, is safe for the entire family, and is formulated with all natural ingredients. Introducing Skleer®! Skleer® is an all-in-one skin corrective and skin conditioner. There are an impressive number of ailments that this gel is claimed to heal, including, but not limited to: acne, itchy skin, dermatitis, eczema, dry skin, rashes, insect bites, minor burns, abrasions, hives and sunburn. Seriously, this product takes the meaning f all-in-one to whole new level. Plus, it is formulated with naturally therapeutic ingredients such as eucalyptus oil, caraway oil, tea tree oil, cinnamon oil and cardamom oil. Skleer® is actually a gel-substance, which delivers these healing ingredients immediately to the lower levels of the skin so they can get to work. What this item does NOT contain are: parabens, harmful preservatives, lanolin, hydroquinone, corticosteroids, salicylic acid, retinoic acid, benzoyl peroxide, and it is not tested on animals. Skleer® is safe for all skin-types, and can be safely used on people of all ages. In my experience, this product is very original. I was intrigued by it because it is used in other countries, and oftentimes other countries have stricter regulations than we do in the USA. Some things that you can find on our shelves here are banned in other countries for how toxic they are. It's one of the many reasons I seek out alternatives for my family all of the time, and why I rate organic products so highly, because even if they are not THE best product in the world, they are better than any other product using toxic chemicals. I really love that this comes in the form of a gel. I am a big fan of gel-style moisturizers because they tend to go on smooth and evenly, absorb super quickly, and well....I just like the texture. The scent of this is a bit odd. It is outdoorsy to say the least, and the brand says that it is the eucalyptus oil that gives it it's scent. However, it becomes odorless once it fully absorbs into your skin. I normally still notice a scent longer than that, but eventually it does wear off. It isn't potent enough for it to bother me, but I will definitely stick to using this as a treatment and not a full-on hand lotion. The bottle itself is pretty small, 1 oz, so it is great to throw in my purse, because you never know when one of the kids is going to get hurt or bit. I have found that preparedness is the most efficient prevention. Nobody gets hurt when we come prepared, but the minute you forget your traveling first aid kit, you have boo-boos galore! I definitely consider this more of a first aid item, if I was forced to put it in a category. I would certainly consider using it for my pimples because I have had very good luck with tea tree oil in the past. Most frequently I have used in as a insect bite treatment (this is going to be an awful year for mosquitoes if my daughter's poor legs have any indication). I find that it is gentle and causes no irritation, and seems to help relieve itch and inflammation. Overall, I would certanly recommend this product if you are looking for something natural that addresses many skincare concerns. If this sounds like something that would come in handy at your house, you can read more about ti on your website HERE, and you can purchase it for $19.99 HERE. This product is backed by a 30-day money-back guarantee, so you have nothing to lose (for the first 30 days anyway). There are so many health fads out there, that barely pay attention anymore. I am not looking to lose weight or be on a strict diet, I just prefer to live a healthy lifestyle. I recently had the opportunity to try Yacon Syrup, and to be honest, I had no idea what it was or what it was used for initially. It is a thick, dark syrup, like molasses, and smells like it too. That being said, it has some interesting health benefits and several uses. One of my favorite part of being a product reviewer is being introduced to new things, I never would have otherwise been exposed to. I tried Peak Fusion Yacon Syrup, and I'm slowly starting to use it more frequently (hey, they say it takes 21 days to form a habit). Yacon Syrup is a sweetening agent that holds an attraction due to it's low calories and low sugar content. The Syrup itself is extracted from the roots of the yacon plant, which is found in the Andes Mountains. It is said to be a good option for those who are diabetic because it has a low glycemic index. It is also a wonderful option for those who choose a vegan diet. Most notably, Yacon Syrup is said to aid in weight loss while encouraging healthy digestion. As a side note, it is also a good antioxidant. What makes the Peak Fusion Yacon Syrup original is the fact that theirs is organic, raw, pure, vegan, gluten-free, non-GMO and with zero artificial ingredients. Plus, each batch that they make is third party tested for purity. I tried this Yacon syrup because I was interested in what it tasted like on its own. I found that the taste was sweet, but on it's own was not something I would take often. It is recommended to take 3 teaspoons daily, but I would recommend adding it to something to take it. For example, you can add it to your morning coffee or tea, a smoothie, and it can be used in recipes as well as a sweetener that is not loaded with calories and sugar. I definitely appreciate how versatile this product is, and with the prevalence of diabetes, I see this as a viable alternative. I definitely do not take the 3 teaspoons per day, mainly because I can't remember. With this purchase you will get e-mailed a mini e-booklet of recipes that you can use the Peak Fusion Yacon Syrup for. This is so helpful, because as I said, I was unsure how to use it. I also get skeptical of items that tell you keep them out of reach of children, or that it is unadvised for use by pregnant and nursing mothers. That being said, I know companies need to watch their back, and too much of anything can be harmful. If you think this is something that would be useful to you, you may purchase an 8 oz bottle for $18.97, HERE. Prices may change at any moment so this price is not guaranteed. I know it's been a little warm out to be thinking about Hot Cocoa, but this beverage is still a childhood favorite of mine. You can most often find me drinking Hot Cocoa in the Winter time. Christmas and snow are entirely more bearable when you have Hot Cocoa to drink. My second most favorite time to drink it is after going swimming in the Summer at my family' cottage on the lake, to help warm up. My kids have grown-up being lovers of Hot Cocoa too, because really, what kid doesn't like to have permission to drink liquid chocolate? My biggest issue with Hot Cocoa is the fact that conventional brands do not have good-for-you ingredients in them. I started making my own homemade mix at home, because I was so disappointed in what was in the available options on the market. That wasn't as helpful when we used the Keurig though. Luckily, there is a brand that cares about ingredients and has made cups for Keurig brewers: Black Bear Market Premium Hot Chocolate. Black Bear Market Premium Hot Chocolate was born when a family was disgusted by the ingredients in a drink that can easily be considered a classic. Reading the list of fake sweeteners and ingredients that cannot even be pronounced was disheartening and they decided to do something to change that. The family behind Black Bear Market created a Hot Chocolate that used only natural ingredients, with no artificial colors, no artificial flavors, and no artificial sweeteners. In fact, their ingredient list reads: pure cane sugar, non-fat dry milk, cocoa, whey, natural flavor, salt, locust bean gum and stevia. They sell a 24 pack of single serve cups for Keurig K-Cup type brewers. They are a small family owned and operated business that has stepped up the game to creating convenient yet health conscious beverages. My biggest fear was that this Hot Cocoa would taste watered down. Most everything I put in the Keurig does, which is why I prefer to use the reusable cups that I can fill to my hearts content with whichever drink I am choosing to have. I used the smallest cup option to try and make it as concentrated as possible, however, it was still watered down. I used flavored creamer in it to give it some extra flavor and thicken it up, and that made it better. When I make hot cocoa I tend to use my homemade mix, and I warm it up on the stove-top with milk. Therefore, I am used to thick, creamy and very flavorful hot cocoa. If you are used to drinking hot cocoa from a Keurig, this will taste no different to you (I have tried a few brands, and they all taste watered down). The benefit here is that the Black Bear Premium Hot Chocolate is made with ingredients that you can pronounce, and are not concocted in a lab, making it, clearly, the better option. If you have a Keurig type brewer and are looking for some Hot Chocolate with natural ingredients, you can purchase a 24-count of these for $15.95 HERE. I would love to see them make this in regular powder packets, or in bulk, because I think it would taste phenomenal! Oils are definitely the "thing" on the beauty scene these days. It seems like everyone has found a place for oil in their beauty routines, and I am no different. I originally thought it was so odd that people would put oil on their face, or in their hair. I just thought it was so counter-productive. I have since learned otherwise, and I use oils everyday. Jojoba oil is one of the most frequently used oils, similar to argan oil, because it has a variety of uses. From moisturizing skin, to healing and protecting your hair, and even being a great make-up remover, it's benefits are aplenty. I recently experimented with Foxbrim's Jojoba Oil, and I can see all of the craze! Jojoba oil is the liquid that resides in the seed of the Jojoba plant, which is a shrub found in southern Arizona, southern California and northwestern Mexico. When purchasing Jojoba oil, you want to make sure you find it unrefined, as the refining process tends to change the substance making it less effective. When unrefined it will have a golden color. If it is refined it will be clear. It has a "nutty" smell, similar to Argan oil, but less nutty. I actually prefer the scent of Jojoba Oil to Argan Oil. Jojoba Oil has a longer shelf life than many other oils because it does not contain any triglycerides. It tends to be most frequently used in natural and organic beauty products including moisturizers and hair care (shampoo and conditioner). Many people make their own natural lotions or body creams by using Jojoba Oil as their carrier oil. Surprisingly, Jojoba Oil is also a fungicide, and can be used to control mildew. I use Foxbrim's Jojoba Oil in conjunction with my facial moisturizer to add a boost of hydration to my face. I mix them together before applying to my skin, and it works wonders on my dry flaky patches. I also use this on my cuticles and even on the rough skin patches on my elbows and feet. I have found that the Foxbrim Jojoba Oil has a light scent that is not disruptive whatsoever, that it absorbs quickly and it does not make your skin feel greasy or slimy. Plus Foxbrim uses organic, unrefined and cold pressed Jojoba Oil, so you know you are getting the best of the best. I have used MANY of their products, and I have nothing poor to say about them. When it comes to oil, a little goes a long way, so the 4 ounce bottle will last you a long time! If you are interested in purchasing Foxbrim's Jojoba Oil, you can do so HERE, where it costs $16.95 for the 4 oz sized bottle. Very reasonable pricing if you ask me! Hands can tell you a lot about a person. Whether it is the dirt from a hard day's work, or the winkles from the years you've lived, sometimes it's your hands that show it more readily than your face. I love taking care of my hands and nails. I was a nail-biter for the better part of my life, so now that I've finally quit that habit, I try to keep my hands and nails looking nice. I try to keep them polished in order to deter biting, but that can take it's toll too. I recently tried a wonderful lotion meant to keep your hands hydrated, while nourishing your nails to encourage their strength. This lotion I speak of is Lady Soma Skin and Nail Treatment, and friends, it smells like cupcakes! What I love about this company is that they make products designed specifically for women. Even more so, I love that they use organic ingredients that are certified organic, and never use genetically modified produce/grains. It is becoming more and more difficult to find products with standards that are as high as this. Lady Soma offers a variety of products ranging from supplements to skincare to a line so gentle it can be used by pregnant and nursing mothers. Their products are free of toxic chemicals that are deemed unsafe and cruelty-free too! The Lady Soma Skin and Nail Treatment is paraben-free, chemical-free and hypoallergenic. The lotion itself is very creamy, and has the consistency of a cream lotion without leaving any greasy residue behind. I use a small pea-sized amount that I rub into my hands, and pay extra attention to my cuticles. I keep this by my bedside, and use a little bit more at night for a deep hydrating overnight treatment. I like to exfoliate my hands beforehand for maximum absorption, and I wake up with baby soft hands. And, like I said, this smells like cupcakes to me, and who doesn't like cupcakes? With extended use, I have found that my hands have been retaining moisture better than ever before, and my cuticles have become less of a problem. I used to have to push them back often because they would grow up very high, but I've found that they have been laying low lately, and I'm appreciating that. As far as my nails go, it wouldn't be fair to make any assumptions because I haven't used only this on them. I always have some kind of polish on them whether it is a color or a treatment, or some combination of both. That being said, my nails have been doing well, so this has likely played some role in that. If this seems like a product you'd enjoy, I encourage you to purchase it via their website HERE. It costs $16.99 which I feel is a decent price. I also urge you to check out the other products they offer. I'd be surprised if you didn't find something for yourself. I'm really interested in the Antioxidant Berry Masque - it sounds amazing! We have had a few really nice days here in upstate New York in the past couple of weeks. I think I've jumped the gun a little and sat outside a little too long watching and playing with the kids. I have gotten a little bit of sunburn, which has proven as a warning that I need to be wearing sunscreen even when I don't think I do. When I get burned it tends to dry out my skin and cause flakiness. My skin tends to be on the dry side anyway because I don't drink as much water as I should. I'm rebellious like that. I recently tried a really great moisturizer from Cutis Vita, and it has made my skin look and feel so much better. Cutis Vita Skin Care makes a lotion called Cutis Vita Advanced Skin Revitalizing Cream. This moisturizer uses all natural ingredients to bring you a body and face lotion. While many other lotions and creams have a main ingredient of water, the main ingredient in this lotion is Aloe Barbadensis Miller leaf juice. Even more specific to Cutis Vita is the fact that it contains a concentration of 65% Aloe Barbadensis Miller leaf juice, versus other brands which tend to have a 10-20% concentration. This is what makes this lotion more "healing" than most others. Aloe Barbadensis Miller leaf juice is said to help with the following conditions: acne, stretch marks, arthritis, eczema, athlete's foot, rosacea, burn, insect bites, and many, many more. Be aware that aloe juice is different than the aloe gel you buy from the store. Aloe juice is very easily absorbed completely into the skin, while aloe gel is sticky, and actually isn't as readily absorbed. I've been using this lotion on my body and have found it to be extremely hydrating. I would apply it to dry flaky skin, and it would stay hydrated for up to 48 hours without re-application! The scent is clean and fresh, and is not strong whatsoever. This is probably the ONLY lotion I would ever consider applying to my face as well. I have to be VERY careful what goes on my face as I breakout if the wind blows the wrong way. The ingredients in the Cutis Vita Advanced Skin Revitalizing Cream are very similar to some of my face creams, and the fact that it says it is used to treat acne tells me it would be worth a shot. I haven't used it yet on my face, but I think I will try it out. I also want to use it on my daughter's eczema and my son's super dry elbows and knees. I was using something else on my daughter which is why I haven't used it on her yet. She just got a prescription for her eczema because it is so bad behind her knees, so I may try this in conjunction with that. Currently the only product that Cutis Vita makes is their Advanced Skin Revitalizing Cream but there are a few different buying options. You can view the different options HERE. One great thing about the warmer weather is that the cold and flu germ-spreading becomes less prevalent. That being said, there will never be enough measures to rid this Earth of germs. Being a germophobe, I wish there were though. I don't like to be sick, I don't like when my kids are sick, and if I am willing to do anything to prevent it. One dilemma I always run into is the fact that when we are on-the-go there seems to be fewer opportunities to prevent the spread of germs, even though that is when we need it most. Well germophobes and moms/dads, I have a solution! Softy Individually Wrapped Hand Sanitizing Wipes. I have reviewed the regular Softy huge canister of sanitizing wipes, and am nearing the end of my container. I hopped on the opportunity to try the Softy Individually Wrapped Hand Sanitizing Wipes, because I always find myself in public wishing I had a wipe with the power to sanitize. These wipes come in a box of 100, 7'' x 8'', durable hand sanitizing wipes. These are so simple to throw a handful in the car, the diaper bag your purse, even your wallet! That way you will never be left in a situation where you need clean hands, and there is nothing around. They are alcohol-free so you don't have to worry about them drying out your skin, and they are even effective on surfaces. I always clean the table when we go out to eat, just in case. The Softy Individually Wrapped Hand Sanitizing Wipes contain Vitamin E and Aloe to leave your skin feeling soft after use, versus sticky and dry. I keep these Softy Individually Wrapped Hand Sanitizing Wipes all over the place. My kids both have a tendency to spill or get stuff all over their faces, so they are always in my purse. Plus, I like to sanitize the shopping cart handle when we do our grocery shopping, especially if the little one is sitting up front. As I mentioned before, I clean off restaurant tables too. Now that the weather is nicer, I will often take the kids to the park to play, and these wipes are essential if I bring snacks too. That way they are not eating all of the dirt and sweat that they get from the playground, not to mention the germs. I also love that these are thicker than the canister of wipes that I got. When it comes to kids and the dirt they find, I need something that will hold up to cleaning their hands, face, and sometimes their whole body, depending on what they got in to! Plus, they smell clean and fresh too! If you are interested in having on-the-go sanitizing, you can purchase your box of 100 wipes for $19.95 HERE. The price may change at any time on these, so do not be alarmed if you click the link and it is different.